Vehicle Livery broadly describes a class of graphics that are applied to vehicles, such as vans, busses and trucks, primarily with the intention of advertising brands or promoting the commercial interest of the vehicles’ owners or operators. Vehicle Livery is typically produced using specialist wide-format printing hardware, vinyl cutting plotters or a combination of the two. 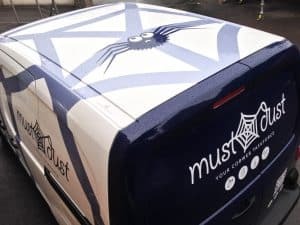 A minimal Vehicle Livery might comprise nothing more than an arrangement of cut and applied lettering in a given style or colour, or a much more elaborate design with printed elements including pictures of product or complex matter that could not be rendered in a single colour. 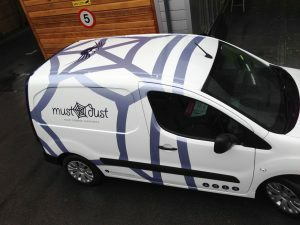 The medium used to produce a Vehicle Livery is, most commonly, self-adhesive vinyl. Such vinyl might have properties that make it conformable so that it can cover the complex surfaces of the vehicle contours and accommodate changes in direction curves’ radii. One such material is Metamark MD-X. This material is receptive to print and can be easily cut so it can easily fulfil the need to produce the elements of a Livery. Limitations in materials and imaging technologies once imposed limits on the practical extent to which a Vehicle Livery can cover a given vehicle. Today’s technologies remove this limitation meaning the every panel surface can convey a message, display a picture or have its colour changed. Using vehicle body colour as an element of Livery is a growing practice. A vehicle, for example white van, can be totally covered in a corporate colour, for example a particular green, and have the further elements of the livery, lettering for example, applied on top of the new colour. When the vehicle lease expires, the Vehicle Livery can be removed leaving a pristine van underneath. This achieves higher residual value in the vehicle. Vehicle Livery is available to suit all budgets and so represents a very practical, cost effective means of broadcast promotion. Typically, brands use Livery as an identity continuation, livery can also promote a sense of place. Recently, devices such as QR codes, links to websites and social media accounts have been used to further connect the observer with the promoter’s livery. Could Voodoo get your message on the road?